If you're looking for simple and cost-effective hygiene training for packaging employees look no further. Our training materials are suitable for induction, basic and refresher training and convey the essentials of food packaging hygiene in a colourful and interesting manner. The Award Winning SaferPak.com web site is owned and maintained by SaferPak Ltd, a Food Packaging Safety Training Provider operating just outside of Manchester in the United Kingdom. If you are interested in Food Packaging Safety read more about what we do below. If you’re not interested in food packaging safety please don’t 'google-off' just yet; you will find lots of useful Business Improvement and Quality Management resources on the web site: Skip to Business Improvement & Quality Management resources. Our business is focused on developing hygiene training materials specifically for the food packaging industry. Our unique training materials are used by many of the major names associated with food packaging, from Salford all the way to Singapore. Read what customers are saying about our training products! "The Packaging Hygiene booklets and posters I have recently purchased from you have proved to be exactly what I have been looking for as part of our ISO9001 and BRC/IOP systems. Hygiene training is a key part of our induction training for new staff and operators, along with the programme of refresher training across the site for all existing people. Previous training has been based on food hygiene practices which, while thorough and mostly appropriate, were not specific to our industry. Searches on the internet proved unsuccessful for packaging specific hygiene training aids, until finding the SaferPak website. As such, the posters and booklets which target issues and practices specific to the packaging industry have now been integrated into our training programmes, both on the individual level, and as a promotional tool across the site. Please keep me posted on any further developments." "Our site manufactures packaging which is so common that virtually all of the households across the UK will have some of it present within their kitchen. Obviously it is imperative that we supply this packaging with no hidden surprises and awareness training is something close to my heart, unfortunately ever increasing restrictions on available time for me to personally perform this training means that this area has slowly been neglected. To find a training tool like the 'The Fundamentals of Food Packaging Hygiene' was a wish come true! After reading through a free sample of the 'Food Packaging Hygiene - Raising the Standard' booklet, I immediately placed an order so that each employee would receive a copy. I was pleased to have found something that covered virtually all aspects of our Company's Hygiene Management System in one fell swoop. When I discovered that a CD was available by the same Company I ordered my copy that very same week as I knew that the quality would be good. On receipt of the disc I set about taking each supervisor through it and we are now running a training programme where each employee sits through the contents of the disc at a time that is more suitable to them. As a Company that works 24/7 we have times during the night and at weekends when employees may be freed from their jobs for a period and this is the perfect tool to make the best use of this time. If anyone is in a similar position to me, where other commitments make it difficult for you to plan and perform training, I recommend that you buy a copy." "Your publication is a perfect compliment to the H & S and Hygiene training given to staff. What I most liked about it was the very simplistic way in which the message is got over. Please keep us in touch with any future relevant publications." 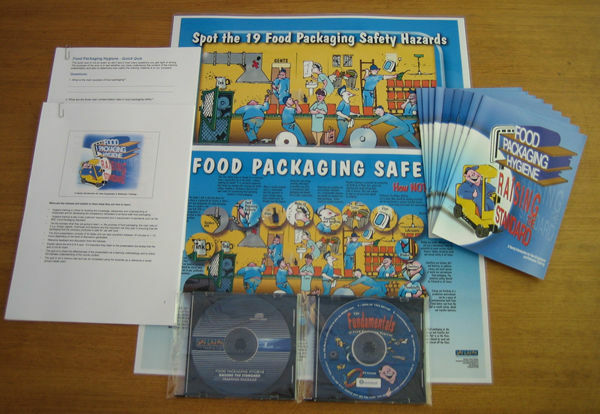 "Very impressed and look forward to seeing your fully developed food safety training package for the packaging sector, talking to colleagues it is hard to find booklets or a package for food safety training for our sector we usually have to tailor actual food training packages - and then get confused looks from our operators who make plastic food bags when it talks about raw and cooked foods! Under the food packaging standards such as the RSPH (Royal Society for the Promotion of Health) and the new BRC/IoP (British Retail Consortium / Institute of Packaging) training is required and your products would be well received by all striving for or in possession of the standards." "We have now trained 150+ people in our organisation for product safety and hygiene. The booklets are given to each individual at the end of a 1 hour long training session.The content of the booklet reflects the seriousness of good hygiene practises in packaging whilst at the same time adding a bit of fun whilst learning and that is important. Also, there are some good examples of personal hygiene illustrated by cartoons that help drive the message home. The feedback that I have had is that the booklet has been very well received and some people have said they can identify some of the cartoon characters as being their workmates ! We now have 2 plants who are certificated to the BRC/IoP Technical standard and this booklet has made a positive contribution to the culture change necessary to meet those requirements. Keep up the good work!" Julie Crowe - Business Process Engineer, Huhtamaki (Lurgan) Ltd.
"Feedback is positive with the leaflets found to be informative and clearly demonstrate reasons for good hygiene practices. The training has been delivered to a small number of new employees on a one-to-one basis, with plans to roll-out training to all existing employees during 2004." "We were impressed with the ease of the website ordering, The prompt delivery and your communication throughout the process which kept us informed of the status of our order. A fast effective ordering system which we will be happy to use again in the future." Laura Nera - Paper Tech Europe Ltd. It was a relief to finally find an information booklet on hygiene aimed solely at the packaging industry. It will help us greatly in our quest for The BRC/IoP Accreditation for packaging suppliers." "We used the booklet as a reminder for existing employees and are using it for new employees induction. We found the booklet to be a very good way of getting the message across, of the importance of hygiene standards. Its simple and to the point with use of funny graphics which no doubt holds employees attention." What's on the web site? The web site is jam-packed with food packaging safety, business improvement and quality management resources. If you are interested in Food Packaging Safety - read on. If not Skip to Business Improvement & Quality Management resources. The BRC Global Standard – Packaging is the benchmark technical standard for suppliers of food packaging to UK Retailers. To read the overview and get a free implementation guide visit the following page: BRC Global Standard - Packaging. Hazard Analysis Critical Control Point (HACCP) is a preventative approach to controlling food and food packaging safety. To read the overview and get a free HACCP implementation guide visit the following page: Hazard Analysis Critical Control Point (HACCP). Register for free membership on our discussion forums and keep up to date with the latest thinking on food packaging safety and business improvement issues. A friendly place for you to network and share best practice with your peers: Enter the Discussion Forums. The Buyer’s Guide is a comprehensive online directory for suppliers of business training and consultancy, management systems training and consultancy, business software, certification, pest control and much more: Find a Supplier. Check out the latest articles page, it's updated regularly with great business improvement and self improvement articles written by world renowned authors: Read the Latest Articles. Top up your toolbox with essential quality problem solving tools and increase the effectiveness of your improvement projects. Download free ‘how to’ guides on control charts, pareto charts, cause and effect diagrams, flow charts, brainstorming, affinity diagrams, histograms and much more: Quality Improvement Tools. Keep up to date with the latest thinking on some of the well known and lesser known quality improvement techniques including six sigma, lean, business excellence, kaizen, process management, hoshin kanri and much more: Quality Improvement Techniques. Use the 'Quick Find Directory' to access all of the resources available on the web site.